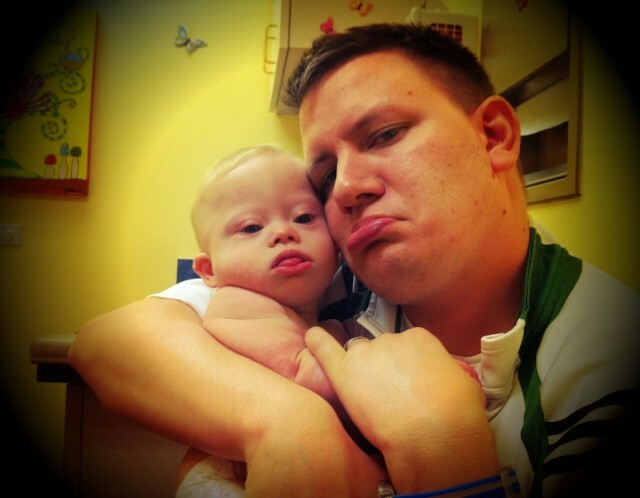 Today Noah got to visit his pediatrician, whom we love. She’s so encouraging. She gets excited when she sees Noah and shows him off. She also takes time to listen to us, because even though I too am a pediatrician, I still have questions. There are no words to express how much we appreciate her and what she does for our son. Pretty sure Noah’s daddy is a bigger baby when it comes to flu shots. Noah received his first flu shot today. I can’t tell you how many times I have heard that the flu shot gives you the flu. I thought I would give you MY reasons why I think the flu shot is important and some myths about the flu shot. I know you all have your own reasons about why or why you don’t get the flu shot. My goal as a doctor is that you have accurate information when making these decisions, but realizing that it is YOUR decision. Getting the flu can be deadly, especially those with underlying health conditions, such as heart conditions (which is quite common in Down syndrome) or asthma. It is also more risky for those who are simply young or old. During my training, I saw several previously healthy kids die of the flu and if a shot can prevent that how awesome is that. When you get the flu you put other people at risk of getting the flu and having the above happen. You can’t get the flu shot until you are 6 months old. So those who can’t be vaccinated are actually probably the most at risk for severe complications. We have to do what we can to protect them and the flu shot is one way to do it. 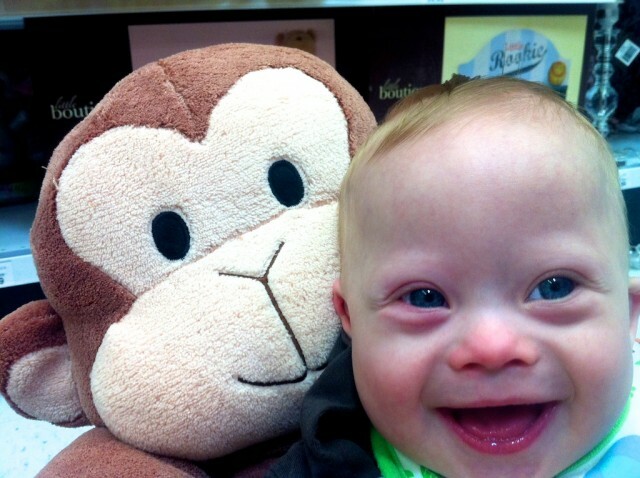 The flu is nothing to monkey around with! It is actually impossible for you to get the flu from the flu shot, as the virus in the shot is dead. Only live viruses can get you sick. Now the nasal spray is a live WEAKENED virus and that is why those with immune compromise should not get the nasal spray. You may feel awful for the 24 hours after you get the flu shot. Your body is creating an immune response to the dead virus so that when you meet the real thing your body can attack it. You may have a fever or feel achy, but that is not being sick with the flu. The flu shot didn’t cover for this year’s flu is another reason you may get sick. A few years ago the World Health Organization projected the wrong strain and a lot of people ended up getting the flu. They do a lot of research, but they can’t guarantee anything. Based on their research the flu vaccine contains the most likely strains projected to happen that year. There is not just one strain. They usually include a type A and type B strain as well as the H1N1 (swine flu) now. All can be present during the flu season. Based on what I have seen (or not seen this year) I think the chances are good we are covered. As with everything involving a medical decision you should consult with your own doctor and not just listen to me. There are things that will change what type of flu shot you get, what office you are sitting in when you get it, and if you should even get it at all. The flu mist should not be given to those less than 2, people over 50, those whose immune system is not up to par either due to illness or medication, ASTHMA, or any wheezing prior to age 5, chronic heart or lung disease, diabetes, kidney failure, children/adolescents receiving aspirin, pregnant women, egg allergy, and those with a history of Guillain-Barre (a condition where you become temporally paralyzed from the legs up). So in other words the flu mist should only be given to healthy individuals age 2-49 (that means no chronic illnesses). The reason behind all those warnings is that the flu mist IS a live virus and there is a chance you can get sick from the vaccine. However, it actually has been shown to work better than the shot, so if it is an option go for it. It also does not contain any thimerosal so for those of you concerned about that it is a great option. Yes the flu vaccine is created by using chicken eggs. So if you have an egg allergy there is a chance you may react to the flu shot. However, you can go to your allergist and they will do a skin test to see if you will react to the vaccine. If there is no response, you are good to go to get the shot. It is actually more common to not react even with an egg allergy. If there is a response, you and your doctor have to discuss if the benefit outweighs the risk. Allergic reactions can be treated so even with a reaction you can get the flu shot. If you have had a severe allergic reaction, a serious reaction, or if you have ever had Guillain-Barre (temporary paralysis that moves from the feet up) you should have a lengthy discussion with your doctor if you desire the flu shot again. My best guess is that no one would be interested in the flu shot again after those types of reactions. I did not write this post to argue about mercury or the causes of Autism. It is a never ending argument and one that I feel has greatly effected the protection of our children. In all honesty I probably shouldn’t have gotten myself started as I get fired up about this topic. Single dose vaccines (meaning they only use one vial per child and don’t stick it back in the fridge) do not contain thimerosal. Those vials that do have multi-doses use thimerosal as a preservative. In 1999 there was a decision to remove thimerosal from all vaccines despite their being any evidence that it actually causes problems. For children under 6 the only chance at exposure is with the multi-dose flu vaccine. There has been no evidence to show that thimerosal or mercury for that matter is associated with causing Autism. If you guys want more information the expert on vaccines in my opinion is Paul Offit, MD, and I recommend you at least read his standpoint by either what is provided on the internet or in his books before you finalize your decision on vaccines. As for my experience, I have never in my career as a medical doctor seen a case of H. Flu (Hib), measles, mumps, rubella (MMR), Polio (IPV), or tetanus. I have seen maybe 5 cases of Chicken Pox which were all mild. I was hospitalized myself at 6 months of age due to Chicken Pox and a staph infection. Those who have trained me have seen all of these diseases and watched children have brain damage, become crippled and die because of them. The fact that I have not treated one child with these conditions is a MIRACLE in my opinion. I have watched children die from pertussis and the flu, both which can be prevented with vaccination. It is something I hope no parent has to experience. When your child gets the flu shot for the first time they usually have to get two. Noah will be going back in one month to get his second flu shot to be fully covered. The Day Didn’t End After The Flue Shot: Therapy and Food Time! Our day continued after our visit to our primary care physician (PCP). We went to therapy, where Noah continued to act like a rock star despite having to get shots earlier in the day. By the way, you’ll notice the toy Noah’s physical therapist is using in this video was also featured on our best gift ideas post….this is seriously one of the best toys you can can buy under 10 dollars! We also did some advances in his feeding. We have been using pureed fruits or vegetables for the last few months and today we thought we would try meats. They don’t smell nearly as good. I haven’t mastered the art of pureeing meats so I am using store bought versions. I have heard that a lot of kids aren’t fans (I really can’t blame them based on the smell), but Noah seemed to not mind. He gobbled it down just as he usually does. He’s trying to get this whole grasp thing down! 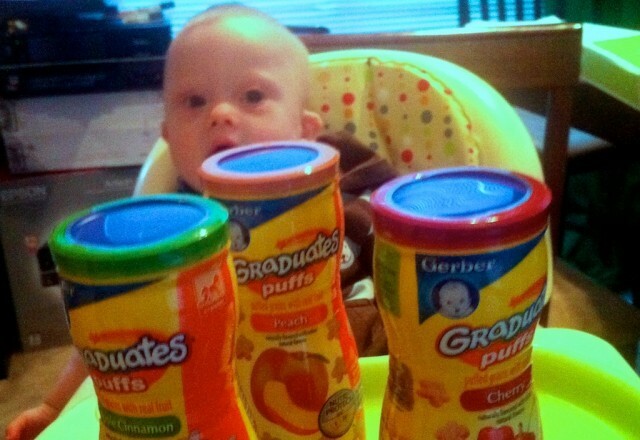 We also thought we would try some Gerber Baby Puffs and let Noah attempt to feed himself. This is when knowledge of grasp would have been helpful. Noah could not quite figure out how to pick these up. If I had only known better, I would have realized that his grasp was not ready to pick up the puffs as it requires a pincher grasp where at this point Noah only consistently uses the palmar grasp. (If you’d like to learn more about grasping, I discussed the various grasps in a post entitled: Learn To Grasp: A Cheap And Easy Fine Motor Skills Exercise Your Child Can Do At Home.) Oh well, he still liked it when we put these in his mouth. It was a new experience for him to have something crunchy. They dissolve quickly so they are easy for the child to swallow. We will keep practicing and someday soon, Noah will be chomping on these all by himself. He’s not to sure about the puffs yet! How old is Warren by the way? Dude, me and needles don’t mix. Ouch! Kudos to you for putting out accurate information about vaccinations. it is a personal soap box of mine, particularly around the issue of risking the health of those who are too vulnerable to be vaccinated. Every mother who vaccinates gets a gold star in my book! Our pediatrician vaccinated my entire family for flu and pertussis when Noah was born 🙂 I think it is great when people are willing to look out for others. My pediatrician talked me into getting flu shots for my kids when they were little, I got them too. And we got sicker and sicker. Now I have teenagers with weak immune systems and allergies my husband and I do not have. No more vaccination for my kids. I let the doctors hurt them enough :(. Time to take back their health by giving them good food and not filling them with poison! I love reading about Noah and your family. I have been looking at vaccines recently and I was wondering about Thimerosal. You said that they decided to take it out of all vaccines. When I looked up the ingredients on the CDC webpage it is still listed in all of the flu shots. Also how concerned should I be that there are other ingredients that seem dangerous like formaldehyde? Thanks for your knowledge and sharing it with us. PS Noah has AMAZING eyes–what a wonderful shade of blue. Shots are no fun. My youngest got her shots today, and she was not happy about it. She forgot about it quickly though and was happy as can be the rest of the day. Since Noah is still working on grasping, you might want to see if your local store sells Baby Mum Mum. They are larger in size, so he might be able to pick the whole thing up and nibble on it. We started getting these for our youngest and she really liked them. At first we had to break it into pieces just so she wouldn’t try to eat the whole thing in one shot, so you might need to try that out too. Anyway, just thought I’d mention these if you haven’t seen them. 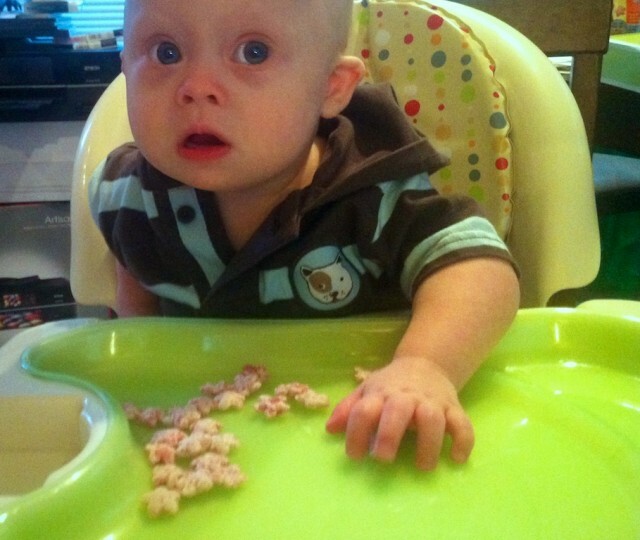 I’m so glad I found your blog…I love reading (and looking at the pics) about adorable baby Noah. Oh that post is coming. 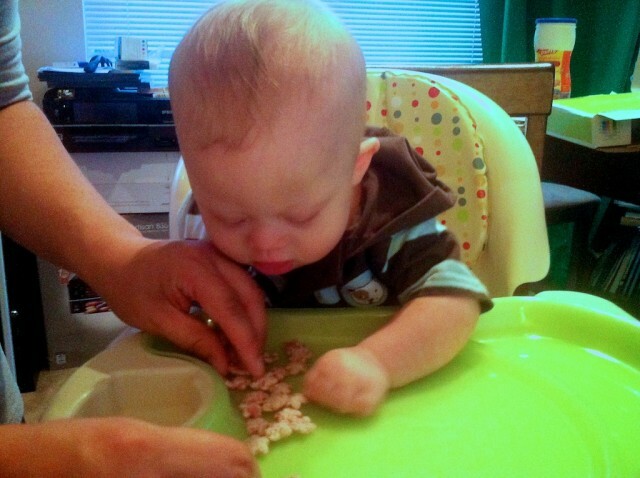 Figuring out what to feed your child based on their grasp changed our life. I wish you had been around when this video was actually recorded, I don’t know if you have noticed, but the date of this day is actually in Sept. We are behind (a lot behind) on our posts. We keep having major events happen in our life that throw us back a bit. We have all the videos so they are coming. Hopefully you keep coming back. Corbin (4 months) takes his vax like a champ. However, I’ve always been against getting the flu shot because I’ve only had the flu 3 times in my 28 years. This post makes me reconsider that a bit – maybe the little guy makes a good reason. 🙂 I will just leave it at that. My little boy has his flu shot every season and he takes his shot in the arm like a real man! He does not cry but just has a huge grin on his face every time. I also line up for mine as I am his main carer.It is peace of mind to protect him as he has other health issues to deal with, and he does not need the flu on top! Harry had his flu jabs for the first time in October. He was a star! He didn’t even bat an eyelid when he had it. In fact his brother started crying incase they hurt Harry! I think Harry is really used to having needles now as he has had so many in the last year. I get a flu shot every year for two reasons. As an asthmatic I don’t need to get the flu and end up in the hospital (happened once…never again). I’m also a medic so I don’t want to get the flu from any of my patients! Thanks for the information Noah’s Mom! It is my pleasure. People think the flu is no big deal, but some people get really sick and it is scary. Way to protect yourself!! Oops…didn’t notice the video date. 🙂 now that I’ve found this blog, I’ll definitely keep coming back. Noah is too adorable to not want to come back and read about. Thanks. We’re just a **little** bit behind on our daily videos, but we are trying to get caught up. Thanks for this post. I really appreciate you taking the time to write it. Lots of our friends are very outspoken opponents of vaccines and sometimes it’s hard to know what is the right decision. We’ve decided to vax our son with DS who is 7 months old. So far, he’s gotten it all, but has gotten a bit behind due to sickness/colds. I just don’t like the tsk tsking from our friends that we’re doing something wrong. It’s annoying, but we’re going with what we feel is right! It is nice to hear from another family who believes it’s ok, too. I can give you a arsenal of responses if you want 🙂 not that they will believe you since I use medical research which they think is bogus. You have to do what YOU think is right not what someone else does. It is YOUR child and in my opinion you could be saving his life 🙂 Go Mom!! I have a question, lets see if I get a responce, so far I’ve never seen a responce to my comments. O.K. my twins have special needs, not Downs or Autism, but developmental delays. They are 14 but function about the level of a 7 or 8 year old. They also have some anxiety issues. So getting shots is a major battle. We have to hold them down, which is getting harder and harder to do as they get older. Medi-cal our states medicaid won’t pay for the mist for the flu and they do have very, very mild asthma, so it’s really not an option. So since they are older and extremely good about washing their hands and since my husband, myself and our older daughter(16 typically developing) have had the shot we are seriously considering skipping it for the twins. We have done all the regular vaccines. What is your opinion? I share your appreciation for a great pediatrician. Our doctor has the ability to listen and speak to us at an appropriate level. I hate being talked to like a child, I am a medical assistant so I know some of the medical stuff, but I’m not a doctor so if you get too technical you loose me. She loves all three of my girls has watched them grow up for over 10 years. She gets the twins in a way no other dr. has ever done. So hurrah for great doctors!!! It’s ok, one thing I have learned it 14 years of parenting is rarely is there one right answer. Unfortunately we have tried all the distraction techniques mentioned. As I mentioned they are 14 and even with the delay a lot of them are like “yeah right mom, we aint falling for that” Unfortunately when we go to our pedi, that is the first question they ask. The biggest problem is holding them down. They are now about 100 lbs and just over 5 feet. You know when people are stressed and the fight or flight horomones kick in…oye who knew they could be so strong. I think I’m going to call and ask about the spray again, if there is some way we could do that…I would be one happy mom and I am sure the nurse at our dr.’s would be too. Great post mom. We promise to do the right thing! He is a great boy! 🙂 We’ve gotten him all his regular shots so far (although we did skip the flu shot this year, usually we get it every time). He’s generally a champ about it, he fights about as much as when they want to check his ears. :)As long as we let him watch when they are going to draw blood, he does fine. If they try to distract him we actually have more trouble with it. This has thrown many a phlebotomist for a loop. People are funny about vaccines. I worked as an in home care provider last year to a little boy who is undiagnosed but at the age of 2, he started having seizures, lost the ability to walk, stopped talking, and is now completely paralyzed and tube fed (He’s 9 now). The current best guess is that he had a bad reaction to a tetnus shot, but his mom is convinced that it was his regular vaccines and so they have stopped vaccinating their whole family. It’s hard when you can’t figure out why things happen. So I’ve had many arguments with his mom over Warren’s shot schedule. Bottom line, even if it was because of Vaccines, I would rather have Warren end up like her son, than die from something that could have been prevented. Being vaccine injured myself, I will pass on getting the flu shot as will my family. I belong to a network of vaccine injured individuals and people with vaccine injured children (all doctor diagnosed FYI, they are not tin foil hat wearing conspiracy nuts) and I have to say that I feel the risks associated with the vaccine are far greater than the risks associated with getting the flu. There are two people I know of in real life who have been disabled (lost the ability to use their limbs) after receiving the flu shot. This is not some scare tactic to debunk your post, it is something I have seen with my own two eyes. When I was pregnant my mother in law scared my husband into getting the H1N1 shot and I watched a man who had never been sick in the eight years I had known him call into work for almost a month straight. Prior to that and since he recovered my husband has not been sick. Not even a sniffle. I appreciate that you wrote there are adverse reactions that can occur, but I think they are much more common than people know. It is estimated that only 1 to 2% of adverse reactions to vaccines get properly reported to VAERS. I urge everyone to do their own research before rolling up their sleeves. Knowing your family’s health history is essential, but in my case none of that helped me. It was not until the vaccine had irreparably damaged my immune system that I was aware of the dangers of being vaccinated. I am sorry to hear that you were injured from a vaccine. As with every medical treatment there are risks as well. I can understand your viewpoint. As a medical community we look at it from a whole picture, but you could care less about the whole picture because you are the percentage who had an adverse response and to you it is a 100%. Thanks for sharing your story, it is important to hear. Please do not assume you know anything about me or what I care (or care less about). I look at things from ALL angles. I read as much pro vaccine literature as I do alternative literature. Vaccine injury is very real and we do not have the real scope of how wide spread it is. I just wanted folks to hear from someone who has been damaged. Please do your research before you roll up your sleeves and do NOT simply rely on a doctor to tell you everything is going to be OK. They told me that too right before they stuck me in the arm and changed my life forever. They told my two friends who are now in wheel chairs the same thing. Just do your research and if you do have an adverse event report it yourself to VAERS (cause most doctors will not do it for you hence the skewed percentage of events reported). I hope you know I was not trying to be rude. I wish tone of voice came across in writing. I have learned a lot about percentages in the last year in that they don’t really matter if you are the one it happens to. I can tell a patient that this will for 99% sure do something…but what if they are that 1%. I am glad you shared your story here. I will make sure to report! Thanks 🙂 It is hard to gleam tone from text. I wish you and your family well. You have a beautiful little boy and it is obvious you both adore him. This is taking me back several years, but I remember when Julia was an infant (she’s now 14 :-)) I used to dip her fingers in honey or maple syrup so that she could pick up the cheerios with her hand and master that plate to mouth action even before she had a perfected pincer grasp. Eventually, we make just her thumb and forefinger sticky which helped as well. Noah is gorgeous! With all due respect, how about some information on BREAST FEEDING as it relates to boosting the immune system? Also, as I understand it, the flu vaccine is developed a year ahead of time every year, attempting to anticipate which strain of flu is headed our way. And sometimes it’s off the mark. In any case, I dispute that a a supposedly compromised immune system, as in the case with Down syndrome, is all the more reason to receive a flu vaccine – or any other vaccine for that matter. It doesn’t even make sense. A person going through cancer treatment who has a compromised immune system resulting from chemo is instructed not only to not receive any vaccines, but to not be exposed to anyone who has recently received a live-virus vaccine (I know this because my husband went through cancer treatment three years ago). Why? Because a compromised immune system has trouble metabolizing the vaccine and it can, in fact, be harmful. Most doctors won’t even give vaccines to kids who are actively sick with a cold or whatnot – because their immune system is compromised, and therefore may not do well with the vaccine. Additionally, children with Down syndrome are already at a higher risk of developing autism – that is a fact. Another fact is this: NOBODY KNOWS WHAT CAUSES AUTISM. Period. It is therefore irresponsible to say definitively what does NOT cause autism. There is very likely a genetic link triggered by environmental sources, and I think it’s safe to say that the environmental trigger is different for different children already possibly genetically predisposed to developing autism. For some it is vaccines, for others it is other triggers, but to say that it is definitely NOT vaccines, and that vaccines are safe for everyone, and that everyone should get them – that’s irresponsible. Those of us parents who choose to delay or avoid vaccines do not make the decision lightly, and until the definitive cause of autism is found, and until vaccines stop carrying the risk of neurological effects like seizures (clearly stated in the warnings on vaccines like Gardisil), I’m steering clear of them. I am going into Noah’s Minute withdrawal. Loved this clip — especially seeing Noah pull up to sit to look at that cool toy. But I was hoping to see what he was up to today! I just posted the next video of our little man. I hope you enjoy, and thanks for loving on our son. Loved the little video. Kudos to Noah’s Dad for demonstrating how to take a shot like a man….I won’t mention the fact that I saw him wincing…hee hee hee. All the while, I too have researched about vaccines. There is no place down here that offers the “live” virus. It is all “dead” and after all that is said and done, we have definitely agreed that the vaccination is the smart thing to do. We have friends who are pediatricians, we have friends with autistic kids (2 in one family also) and we have heard what they have had to say. The best part is that even the pediatricians tell us they vaccinate themselves AND their kids. I appreciate your input. It’s good to see your thoroughness on the matter. In addition, I am still breastfeeding and researched all that too. We got vaccinated! We certainly don’t want to compromise our lives, our little man’s life nor the life of the people around us. By the way, I am really impressed with all of Noah’s energy. When Enzo gets a shot, any shot, he takes a nap, and then another, and then another!! We choose not to get flu shots in our house. Having two girls with compromised immune systems, I choose not to inject anything more than I have to into them. That said, we do go to extreme measures to protect ourselves (and others) by taking Juice Plus, loads of Vitamin D3 and we also flush the kids’ noses with a rinse every single day, whether they are congested or not. Gotta flush out all the toxins. 🙂 And you know what, none of us have ever had the flu, yet everyone around us has. I think it goes to show that you can steer clear if you are doing the right things. OK so I learned that I SHOULD not have gotten the flu mist..:) Thanks for that info, I will remember it next year! I’m sorry but I know a friend who has to take it because he works for the army and every time he gets it… right away gets sick and brings it home to his family. And with me I don’t believe in the shot so I never take it. And I can tell you for a fact I never get sick not even a little bit. So I won’t never take it or make my kids take it when I have some! I’m sorry to hear about your friend, but he couldn’t be getting sick from the flu shot. As we mentioned in the blog post there isn’t a live virus in that shot. Praying for no ill side effects from vaccines – he’s a beautiful baby who was born with a perfect immune system. Thanks for your prayers, but he tured out find. (This video was from a while ago.) Vaccinations are safe and effective. Also the article takes what the CDC said way out of context. The link you posted is from an anti-vaccination website. (There’s no peer reviewed evidence on that site.) It’s dangerous to take websites like that seriously, that is one of the big dangers of the internet. It makes everyone think they are an expert on everything. Noah is such a cutie! I can’t give my Noah the flu shot because he’s only 3 months but I made sure to get it. As parents we need to do our part too! ?